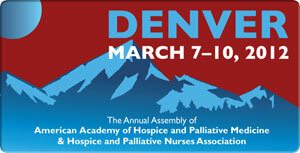 Greetings from the mile-high city of Denver, Colorado, where many of my palliative care colleagues are together for the American Academy of Hospice and Palliative Medicine/Hospice and Palliative Nurses’ Association Annual Assembly. In addition to me, Dr. Catherine Kelly-Langen from our palliative care team, as well as Dr. Dianna Yip, one of our palliative care fellows, are representing Akron Children’s at this important academic meeting. It’s a great opportunity to network with like-minded people, as well as learn the latest and greatest in our emerging discipline. Pediatrics has an important seat at the table here. There was a full day of preconference sessions, and the pediatric options were well-attended. Every session offered something relevant to our field. From the scientific committee, we heard that the quality of submissions was extremely high – and the number of attendees is also remarkable. We’ve really crossed the tipping point and are moving toward creating a sustainable future so that every child with palliative care needs and his/her family can have access to high-quality care. This morning’s keynote is about gender differences in grief. Kenneth Doka, a true giant in the field of bereavement, told the story of our very own Jane Nichols, who helped establish Akron Children’s bereavement program in the 1970s. It’s a lovely opportunity to remember the contributions that Jane made to our hospital, our foundations in palliative care, and the ongoing care we provide to families facing the loss of a child. In the second keynote, Dr. Christian Sinclair spoke about the importance of social media, and how we all need to get more involved and engaged. He showed the video of Ben Breedlove, the teenager who died this past Christmas of congenital hypertrophic cardiomyopathy, one week after posting a very intimate and widely-watched YouTube video of his journey with his disease. This week, our chaplaincy staff used this same video and teaching technique in their Pediatric Palliative Care Curriculum session on spirituality. So the world really is more connected in more and more intimate ways. I am making a commitment to join the online community in more active ways, helping to tell the story of pediatric palliative care. Through the amazing power of social media, perhaps we can all work together to eliminate the culture of fear around pediatric palliative care, and create a world of informed patients, families and care providers, all working together to achieve the best quality of care we can.